On the 26th (Sun), take in nature's colorful creations at Lalbagh Botanical Garden and then boost your wellbeing at a local thermal spa. For traveler tips, more things to do, reviews, and other tourist information, refer to the Bengaluru travel itinerary planner. Mumbai to Bengaluru is an approximately 4.5-hour flight. You can also do a combination of bus, taxi, and flight; or drive. Plan for little chillier nights when traveling from Mumbai in May since evenings lows in Bengaluru dip to 26°C. 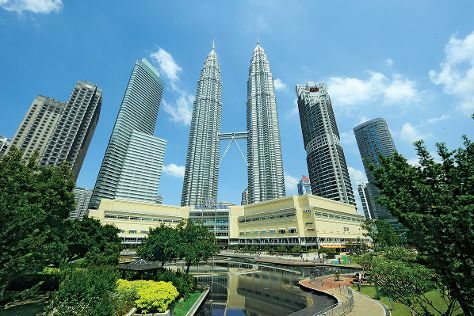 Wrap up your sightseeing on the 26th (Sun) to allow time to travel to Kuala Lumpur. Start off your visit on the 27th (Mon): relax and rejuvenate at some of the top local wellness centers, explore the world behind art at Islamic Arts Museum Malaysia, and then stroll around KL Bird Park. Here are some ideas for day two: walk around KLCC Park, Head underground at Batu Caves, then admire the striking features of Petronas Twin Towers, then take in panoramic vistas at Menara Kuala Lumpur, and finally see the interesting displays at National Museum. For ratings, more things to do, where to stay, and other tourist information, go to the Kuala Lumpur day trip app . You can fly from Bengaluru to Kuala Lumpur in 8 hours. Another option is to drive. You'll lose 2 hours traveling from Bengaluru to Kuala Lumpur due to the time zone difference. In May in Kuala Lumpur, expect temperatures between 39°C during the day and 28°C at night. Wrap up your sightseeing on the 28th (Tue) early enough to travel to Ubud. Kick off your visit on the 29th (Wed): look for all kinds of wild species at Sacred Monkey Forest Sanctuary, then indulge in some personalized pampering at some of the best spas, and then go for a walk through Campuhan Ridge Walk. On your second day here, explore the fascinating underground world of Elephant Cave Ubud, then contemplate in the serene atmosphere at Tirta Empul Temple, then identify plant and animal life at Elephant Safari Park, and finally relax in the rural setting at Tegalalang Rice Terrace. To find maps, where to stay, other places to visit, and tourist information, use the Ubud travel planner . Fly from Kuala Lumpur to Ubud in 6.5 hours. Traveling from Kuala Lumpur in May, expect nights in Ubud to be about the same, around 28°C, while days are slightly colder, around 36°C. Wrap up your sightseeing on the 30th (Thu) to allow time to drive to Denpasar. Explore the numerous day-trip ideas around Denpasar: Kuta Beach - Bali (in Kuta), Tanah Lot Temple (in Beraban) and Seminyak Beach (in Seminyak). There's much more to do: indulge in some personalized pampering at some of the best spas, look for gifts at Krakakoa Chocolate Factory & Store, tour the pleasant surroundings at Pantai Sanur, and take in the exciting artwork at Nacivet Art Gallery. To find other places to visit, photos, more things to do, and other tourist information, read our Denpasar online tour itinerary maker . Denpasar is just a stone's throw from Ubud. Expect a daytime high around 36°C in May, and nighttime lows around 28°C. Wrap up your sightseeing on the 2nd (Sun) early enough to travel back home.